All art, one could say, is inherently abstract, for the process of translating ideas into form - to make one thing stand for another, or to make images on a flat surface appear three-dimensional - is a type of abstraction. 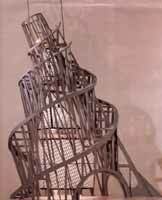 Throughout history, there have been many different styles of art that have utilized an abstracting approach. But it was not until the early 20th century that what is commonly referred to as abstract art was established, as artists began making works devoid of any evident reference to the world of appearances, creating form for its own sake, subject to the laws of art rather than those of nature. By eliminating all illusionistic representation from their work, abstract artists have operated on an aesthetic frontier - what Piet Mondrian called "the edge of the abyss." They have explored new territory with a spirit of dedication and adventure that another artist, Eva Hesse, described in 1969 as "total risk, freedom, discipline." The phenomenon of abstraction radically altered the course of 20th-century art, initiating a sea change that continues to be felt within contemporary culture. This landmark exhibition is the first to examine abstract art from its origins around the beginning of the century to the present, with a focus upon the primary voices and movements that have shaped its evolution. Although there are many possible sources for the genesis of abstraction, it is generally agreed that Impressionism opened the floodgates. Using pure colors and stippled rushstrokes to evoke the play of light across forms from nature, Impressionist painters dissolved the illusion of painted objects as solid, immutable things and asserted a subjective interpretation of the world around them. They also set the stage for the abandonment of natural color (such as flesh tones for human skin, or green for vegetation) by making colors a function of of the artist's experience of an object at the moment it is painted. This approach became increasingly prevalent just after the turn of the century, in Symbolist paintings by James Ensor, Paul Gaughin, Edvard Munch, and others; brightly colored pictures by Georges Braque, Andre Derain, Henri Matisse, and their Fauve colleagues; and the nightmarish visions of such German Expressionists as Ernst Ludwig Kirchner and Emil Nolde. And then came Cubism, the style developed by Braque and Pablo Picasso around 1907, which did more to shatter the tenets of representational painting than any of its predecessors. After fragmenting objects into overlapping faceted planes in muted colors, depicting each object as a system of kinetic rather than static forms, Braque and Picasso went on to further undermine the illusionism of painting through the technique of collage, incorporating real objects (a piece of imitation-cane oilcloth, rope bits of newspaper) into the space of the painting. Yet despite all these radical steps - the adoption of unnatural color, the dissolution of forms, and the rejection of illusionism - the subject matter of Cubism, like that of preceding Modernist movements, remained faithful to the traditional genres of painting: portraiture, still life, and landscape. In short, representation had yet to be abandoned. It was not until the pioneering work of Vasily Kandinsky, Kazimir Malevich, and Mondrian in the early to mid-1910s that painting became truly abstract or non-objective, with the advent of compositions that are almost entirely self-referential. Although they worked independently from one another, these artists were united by a belief that abstract art was capable of evoking a spiritual experience. Expressing themselves through philosophical writings as well as paintings, they practiced art as a metaphysical quest for higher truth. For Kandinsky, a central figure of German Expressionism, the breakthrough to abstraction occurred around 1911, when he began to paint densely layered compositions of free-floating lines and areas of color, with titles such as Improvisation and Composition, that reveal his desire to instill visual form with the properties of music. In some of these early abstract works, for example Painting with White Border (1913), one can still discern landscape elements like hills or trees, but their features have been reduced to a lyrical mosaic of line and color.
. . . the embodiment of modernity . . .
By 1915, Malevich had invented a new, geometric visual language that he called Suprematism - the name he gave to paintings, such as Suprematism (Eight Red Rectangles) of that year, that consist of one or more squares or rectangles on a white field. 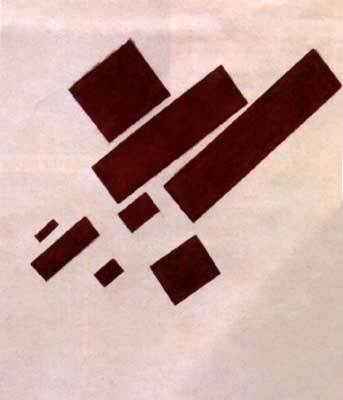 Malevich wrote of visualizing "a state of feeling," of creating through abstract painting a sense of bliss and wonder. Thus, his works often contain unanchored forms that are meant to evoke floating or flying, as if to make the viewer imagine being transported to another dimension. Mondrian also took a reductive approach to form, but one with a tighter geometric orientation and stricter compositional order. Like Kandinsky, Mondrian was inspired by landscape, but he interpreted it in his earliest abstract paintings as a series of interlocking vertical and horizontal lines., A principal member of the De Stijl group - a loose confederation of artists and architects who attempted to integrate art, design, and architecture with a unified, rigorous approach to form - Mondrian reduced elements to their purest state in compositions of geometric order and balance in order to express universal harmony. However, not all artists who made geometric art were concerned with spirituality. The Russian Constructivists, who developed a rational, materialist approach to art shortly after the Russian Revolution of 1917, used geometry as a metaphor for order in a society ravaged by chaos. In their work, beauty became subservient to utility, and painting became a superfluous activity, unless it carried a political message. In the hands of the Constructivists, abstract art was made from modern industrial materials, with the artist serving as engineer, and it performed a social, not a spiritual, function. 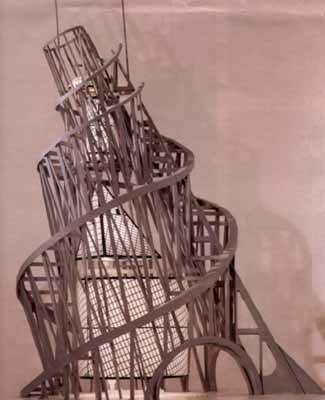 Vladimir Tatlin's Monument to the Third International (designed 1919-20) exemplifies this technological, socially oriented approach to abstraction, using a composition of geometric forays as the basis for a multifunctional government building. Similarly, artists such as Josef Albers at the Bauhaus - the school founded in 1919 in Weimar, Germany, by architect Walter Gropius - promoted the integration of art, architecture, and design within an abstract, geometric idiom that the;y believed was the embodiment of modernity, universality, and mass production. The antithesis to this hyperrational view of art was Dada, a loose-knit movement of writers and artists that flourished in Paris, Zurich, Berlin, Hannover, and New York beginning in 1915 and 1916. Appalled by the horrors of World War I and the hypocrisy of Bourgeois society, Dada artists used abstraction as a form of protest, rejecting conventional representation and beauty as a means of attacking social norms. Kurt Schwitters, in his Merz collages, for example, juxtaposed discarded remnants of contemporary commerce, with the aim of destroying rational, objective logic and celebrating the randomness and absurdity of life. Beginning in 1924, the Dadaists' negation of ordinary reality was transformed into an affirmation of heightened perception of reality by he Surrealists in Paris. Surrealism, though characterized by a wise range of visual styles (including representational painting), shared Dada's radical political orientation and married it to the imaginative freedom of dreams and the unconscious. The Surrealists looked inward in their quest to strip the veneer from the realities of everyday life, rejecting an a priori system predicated on logic and order to explore the realm of the human psyche and the irrational. This approach is exemplified by the biomorphic abstractions of Jean Arp and Joan Miro, which incorporate the effects of chance and unpremeditated design t unlock poetic suggestions of human emotion and experience, and in which childlike drawing signifies a less-studied, and thus more genuine, understanding of form. In the late 1930s and early 1940s, around the outbreak of of World War II, many of the Surrealists fled Europe and settled in New York. Their interest in unmediated expression and "the absolute" soon influenced a young generation of painters struggling to find a voice for American art. 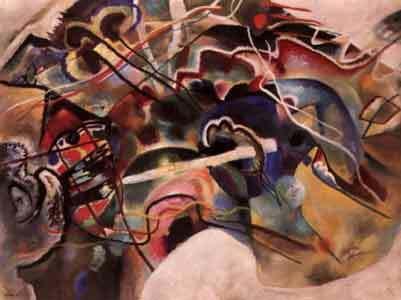 The new movement, which became known as Abstract Expressionism, was heavily indebted to the ideas of the European pioneers of abstraction, including Kandinsky, whose work was championed in this country by the Museum of Nonobjective Painting (subsequently renamed the Solomon R. Guggenheim Museum) beginning in 1939. Many of the Abstract Expressionists celebrated spontaneity and the exploration of the self in paintings bursting with free form and gestural brushwork. The movement's freewheeling spirit and its unbridled, heroic energy are exemplified by Jackson Pollock's method of dripping paint directly onto the canvas in an improvisational act of art making, and the related liberation of form and splashing of paint in the works of Willem de Kooning. However, other artists associated with the movement avoided gesture and emphasized their paintings' flatness. Barnett Newman, for example, explored the expression of the sublime through large color fields interrupted by "zips - one or more vertical lines of contrasting color. mark Rothko's brooding compositions, such as White Band (No. 27) (1954), represent a hybrid of gesture and Color-field painting. And the monochromatic paintings of Ad Reinhardt hark back to works by Malevich and Mondrian, in which pure color and geometric order provoke deep contemplation. This move away from subjective expression toward a more detached sensibility culminated in Minimalist art of the 1960s. Among its earliest practitioners in painting was Frank Stella, whose frequently cited statement "What you see is what you see" encapsulates Minimalism's embrace of a purely abstract art devoid of any spiritual or metaphysical connotations. It's emphasis is on the materiality and shape of the object, the incorporation of the space in which the object is located, and the absence of any personal touch in the work's execution. This sensibility is perhaps more evident in Minimalist sculpture by artists such as Carl Andre, Dan Flavin, and Donald Judd. Here, the works (or their components) were not made by the artists but rather were fabricated by other people working from plans drawn up by the artists. This approach recalls the spirit of Russian Constructivism, a movement cited as an influence by many Minimalists, who shared the Constructivists' veneration of industrial materials and systematic approach to design (though not their goal of creating art in the service of social utopia). By the mid-1960s, another orientation to sculpture emerged from Minimalism through the work of such artists as Eva Hesse, Martin Puryear, and Richard Serra, who are sometimes referred to as Post-Minimalists. Their art is a synthesis of Abstract Expressionist gesture and improvisation coupled with the literal viewpoint of Minimalism. It tends to be more sensual and organic than Minimal art, exploiting the elasticity and tactility of unconventional materials. Other Post-Minimalist artists, such as Richard Long and Robert Smithson, took the idea of the Minimal object's relationship to its site and created works outdoors, in the landscape. Motivated by the desire to increase the scale of their work and extend its longevity, and to undermine the conventional system of presenting art in a museum or commercial gallery, they executed projects that became permanent or long-term fixtures of their surroundings. With more recent art, the course of abstraction has continued to ebb and flow between the appropriation of earlier strategies as a means of critiquing them and the deployment of abstraction as metaphysical engagement. One of the most complex artists to emerge is German painter Gerhard Richter, who for thirty years has alternated between photo-based representation and abstraction By working in these traditionally contradictory modes, Richter has blurred the territorial boundaries between abstraction and representation and has made ambiguity a central element of his art. This extends to his pronouncements on abstraction, for he has asserted that his abstract work is "more real, the other more a dream," while also insisting that abstraction lacks any meaning. Such ambiguity and ambivalence are characteristic of Postmodern art, which has problemized any notion of "the absolute" by claiming that modern culture and the ideas that emerge from it are shaped by an illogical pattern of thinking arising from an abundance of opposing viewpoints. In this environment, it seems unlikely that abstract art can regain the redemptive status that has sustained it for more than eighty years. And yet the theories and traditions of abstract art continue to inform artistic practice, and thus remain relevant to our understanding of new art forms. For as long as art has a place in society where it can distract us from the everyday and propel us into a state of contemplation and reflection, the hypnotic void of abstraction will continue to resonate as a compelling source of inspiration. All artwork is copyright of the respective owner or artist. All other material © 2014 New York Art World ®. All Rights Reserved.